As part of my current assignment I must forecast a macro trend and develop it into a micro product trend for Autumn/Winter 2015/16. 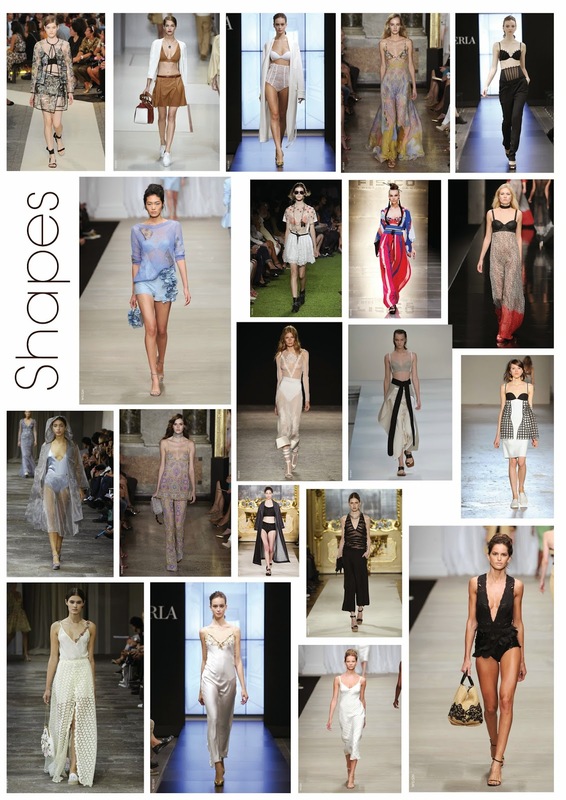 Here, I will consider the influence of the catwalk mainly taking inspiration from SS15 runways. The macro trend considered the 'Ageless Greys' in our ageing population, looking in depth at the way in which the boundaries between the young and old are blurring. We now look at the older generation with respect and see their value and this leads on to my micro trend. With age comes beauty. This is applicable to both the human race and to nature and product trends will be developed with evolving aspects of nature in mind. 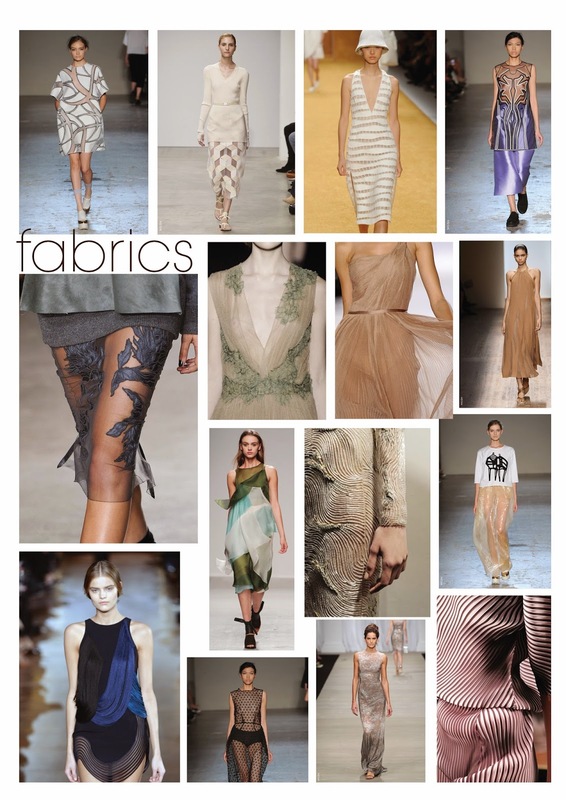 Below are my inspirations for colour, fabrics, prints, shapes and textures. From here, I will apply this micro trend to my chosen brand which is Prada and create a new line of intimates to aid their expansion. 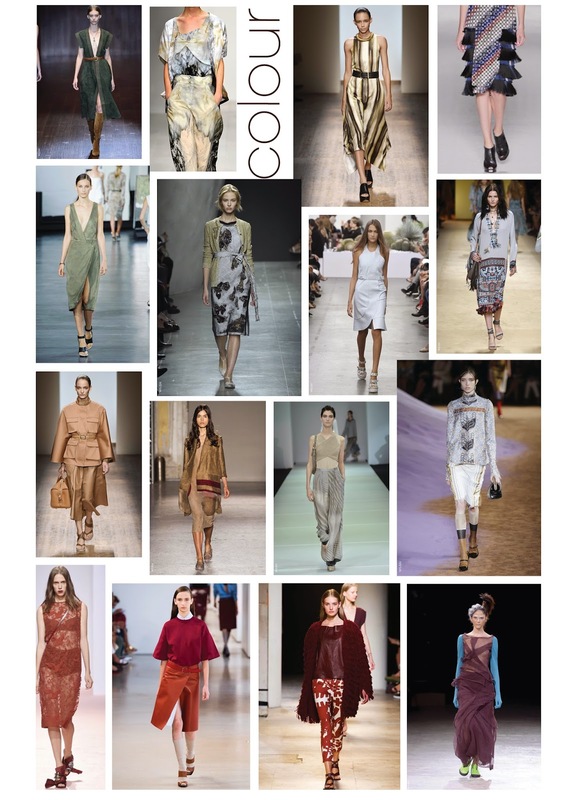 Looking at SS15 for directional colours, I found earthy tones were popular. This includes both the soft, icey blues and translucent greens alongside the rich and vibrant rusts, berries and browns. There were more neutral stoney shades of beige and sand contrasted with metallic golds and deep reds. The combination of colours cohesively represent Autumn leaves and Winter snow whilst offering up a selection of refreshing and unusual tones, such as the natural yellow greens and forest hues. Rocky caves, frozen lakes and falling leaves spring to mind with subtle colours being core to collections and rouges and emeralds complimenting these. Key fabrics on the SS15 catwalks were silky, both matte and shiny. This created a luxury feel and premium appearance, as well as reflecting nature's dewiness. Another directional material was sheer and translucent, often pleated or overplayed with embellishment and appliqué. This creates greater depth and dimension much like layers seen in glaciers and sedimentary rock. It also offers more flirtatious opportunities for intimate brands to reveal flesh. I also noticed several designers using a cut out effect with fabrics and underlaying with sheer mesh in order to create prints and 3 dimensional shapes. 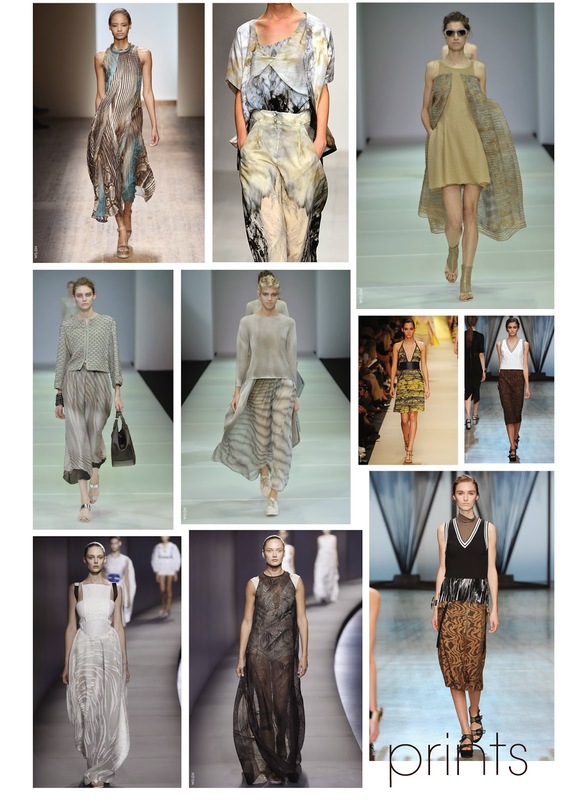 Fabrics were fluid and draped artistically, mimicking waves and wet sand. In terms of prints, I spotted a few different designers taking inspiration from a water ripple to create prints for their designs. This shows that the micro trend was beginning to show through in SS15 but it likely to become much more popular for AW15, with a larger variety of natural terrains finding their place on garments. Colours again were very earthy and reflective of their subject. There was also evidence of marble effect prints and hints of animal skin. The shapes that I will create my develop my final Intimates range for will be primarily inspired by catwalk in addition to the fluid shapes found within nature. SS15 catwalks showcased another season of the popular triangle shaped bra and it looks like it will be here to stay for AW15 but with added twists, such as, unusual strap placement or materials. The longline balconette bra also appeared on several runways and would translate well into an AW15 collection, however, with no underwiring and a softer structure. In terms of teddies and playsuits, deep V necks looked to be popular with short shorts and wide straps halter necks. Collections showed high waisted briefs worn under sheer skirts and dresses and covered midriffs. Silk dresses were made in luxe silk and sat below the knee, some even maxi length, implying that a slip may be longline for AW15/16. An interesting array of textures were displayed from soft pleats to multiple layers of ruffles creating a feminine aesthetic. Layers of various fabrics were combined creating scallop edges and offering peeks at the model's skin. Sheer fabrics were adorned with appliqué and bead embellishment in addition to unusual methods of embroidery. 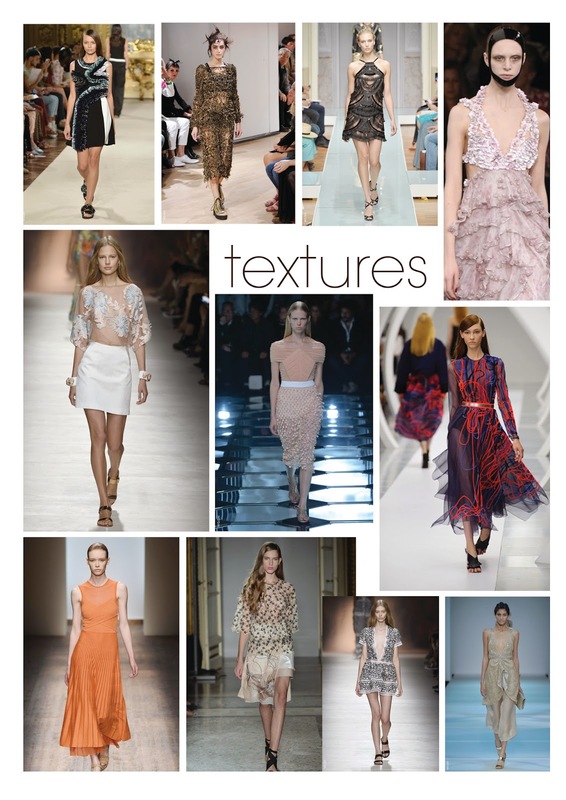 It seemed designers were becoming more adventurous with their textures, leading the way for AW115.